Three willing guys...and a girl they THOUGHT was COLD. One of the Most Beautiful Films of WWII, a Film About Hope. This film is a curious, very memorable and touching romance. The vast majority of the narrative line takes place during a bond-rally tour headed by Ivy Hotchkiss, played by Lizbeth Scott, and Robert Collins, played with intelligence by Bob Cummings. The bond-selling tour becomes a voyage of discovery as well as revelation as Cummings and his two partners, beautifully played by Don Defore and Charles Drake, try to keep Scott from finding out the secret Collins is hiding; at the same time, Scott falls in love with the mysterious fun-loving and irresponsible trio, especially their leader. The film is well-directed in B/W, with very good sets, lighting, costumes and lively camera-work; but the real star is Ayn Rand's scintillating and well-crafted script that keeps "sense-of-life as a positive" foremost even as we begin to wonder at Collin's reasons for keeping all light, uninvolved and gay. The supporting cast consists of old Hollywood professionals from Franklin Pangborn and Rhys Williams to Julie Bishop and Jim Bannon. 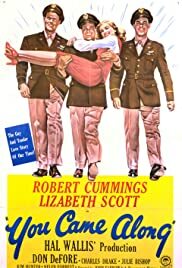 This was a deservedly popular film, a TRop TRen grossing film during WWII, with its story about the need for hope made just at the end of the conflict. ; Once again, Rand's uncanny ability to use honesty and clear definitions here others would use vague ideas turns a routine sort of comedy into an idea-level satire--a triumph of an indomitable man's spirit over adversity. This is a splendid piece of film-making, and one of the most atmospheric of homefront war films, with a lovely main theme and arresting dialogue. A love story for the ages.